Fair Isle Wren, The Haven, 2014. © Ian Andrews. A pair usually nests around the old buildings at the Haven and is your best bet for seeing and hearing this rare and endemic subspecies. Fair Isle Wren, The Haven, 2014. © Ian Andrews. 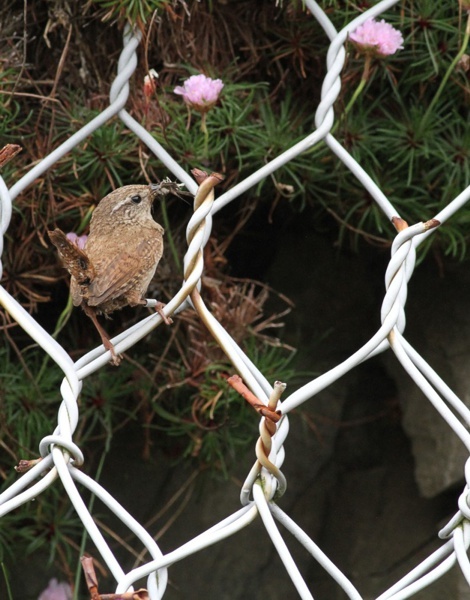 This bird had nested behind the wire mesh at the back of the pier - an unusually accessible nest site, as they usually nest down the steepest cliffs and gullies. The more isolated the island and the longer it has been isolated for, the more likely it is that some of the animals there will evolve into distinctive forms. The classic examples are Madagascar with its multitude of lemurs and Galapagos with its finches. Fair Isle is not nearly so isolated as either of these nor has it been isolated for as long but, nevertheless, at least one of its resident animals has evolved into a distinctive form. This form is not sufficiently different from those on the British Mainland to be a full species, but is considered to be a sub-species. The Wrens of Fair Isle were first recognised as distinctly different from those on neighbouring Shetland and those on the British mainland by Kenneth Williamson, the first Warden of the Fair Isle Bird Observatory. 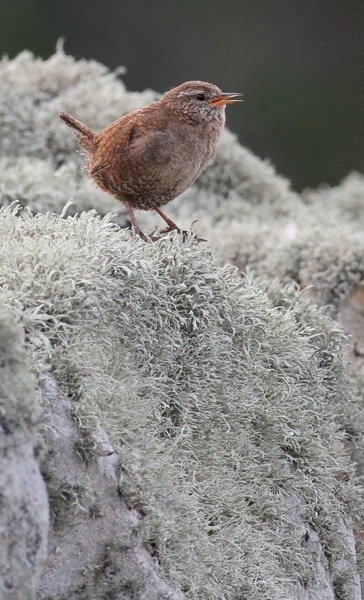 The scientific name for Wren is Troglodytes troglodytes and Williamson gave the Fair Isle Wrens the subspecific name fridariensis, Fridarey being the name given to the island in the Orkneyinga Saga. Fair Isle Wren, The Haven, 2014. © Ian Andrews. 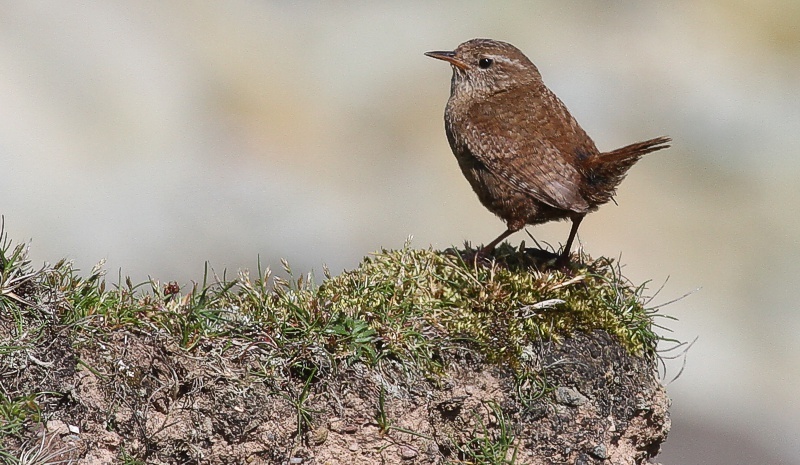 The Fair Isle Wren is the least numerous endemic bird subspecies in Britain and perhaps also in Europe. The population is surveyed by counts of territorial males and between 1950 and 2010 numbers have varied from a peak of 52 in 1964 to a low of just 10 in 1981. Between 2011 and 2017, the population has increased slightly and averaged 39 singing males. The breeding territories of Wrens on Fair Isle are almost entirely confined to the island’s cliffs and very few nest inland. Since the establishment of the bird observatory in 1948, the population has been counted in most years and numbers were highest in the 1950s and 1960s. More recently, numbers have been somewhat lower, fluctuating around a mean of about 30 territories. 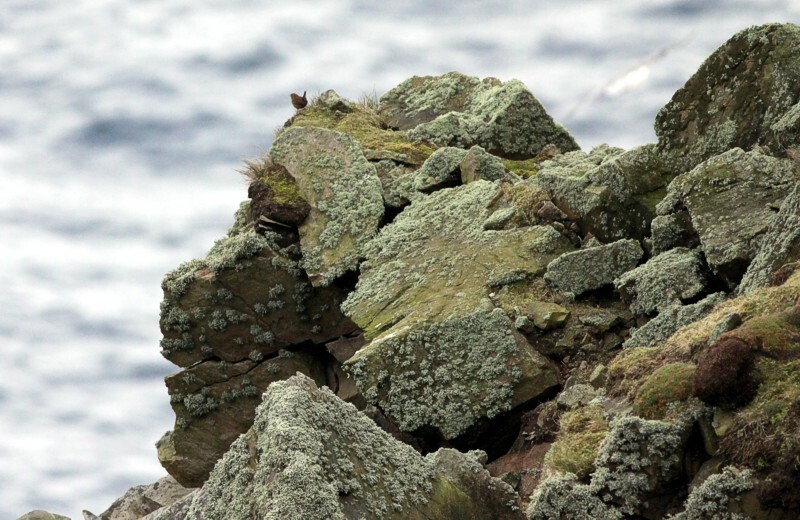 One suggestion is that the increasing Fulmar population on the island’s cliffs may have had an impact on the Wrens. Comparing them with the Wrens of Shetland, Williamson observed that the Fair Isle Wren ‘is a paler and brighter brown above, more rufescent on the lower back and rump and suffused with grey on the head and neck in fresh plumage; it is also whiter and less heavily marked beneath.’ Williamson believed that the Fair Isle birds showed affinities to the even paler brown and whiter wren of St Kilda, T. t. hirtensis, perhaps because of having evolved in similar conditions of climate and exposure. In size, the Fair Isle birds are, on average, between the nominate and Shetland races. Although all four British races of Wren sing what would easily be recognised as a typical Wren song, each has a quality and manner of delivery all its own. The characteristic feature in the Fair Isle song is the inclusion of a phrase which can best be described as ‘weedle-weedle-weedle’. This comes twice in a full song, the first near the beginning and the second towards the end (Pat Sellar 1974). Nominate race birds do occasionally occur on passage on Fair Isle, and are mostly seen in spring and autumn. Number of singing male Fair Isle Wrens, 1950-2017 (updated from a paper by Aspinall & Aspinall in the 2009-10 Annual Report). 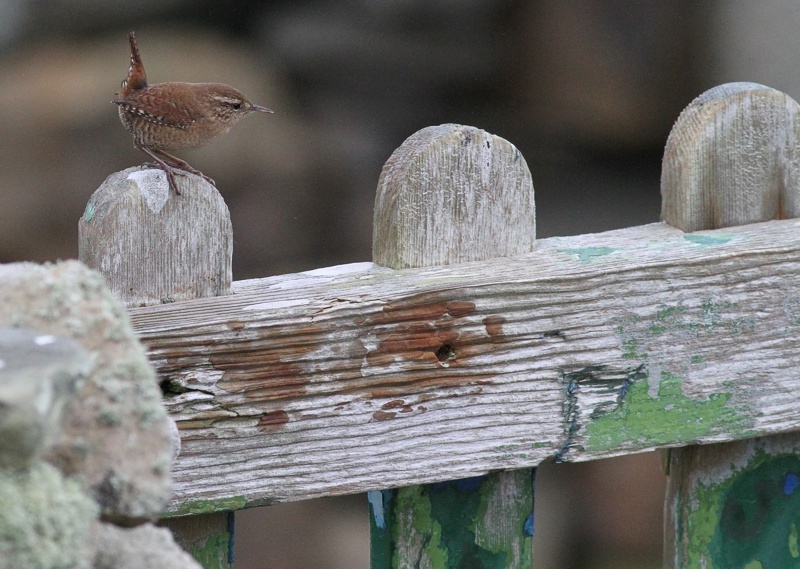 Fair Isle Wren, Midway, 2013. © Ian Andrews. 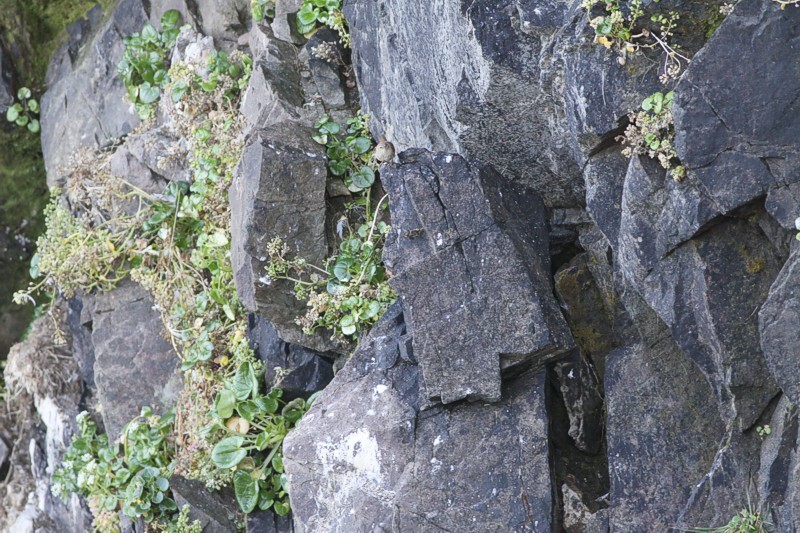 Birds are regularly seen away from the cliffs in autumn and winter. 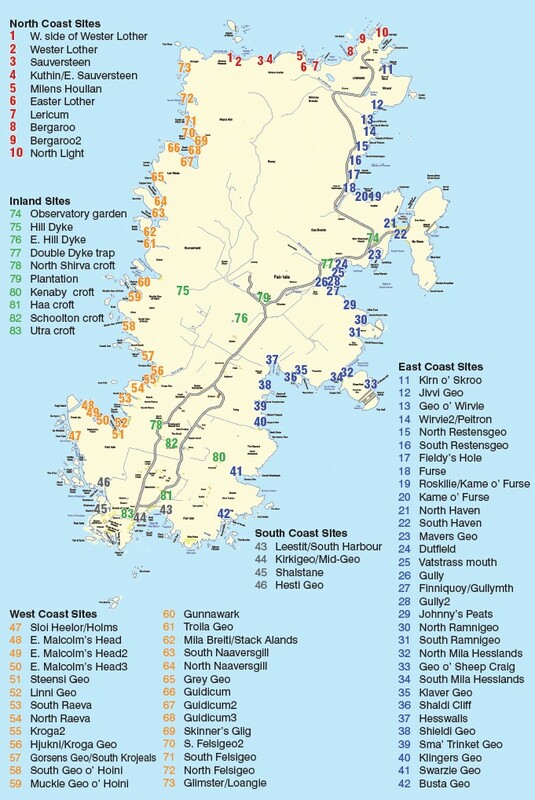 Fair Isle Wren territories, 1950-2010 (from a poster in the Observatory). Fair Isle Wren: distribution of territories by area (from a poster in the Observatory).